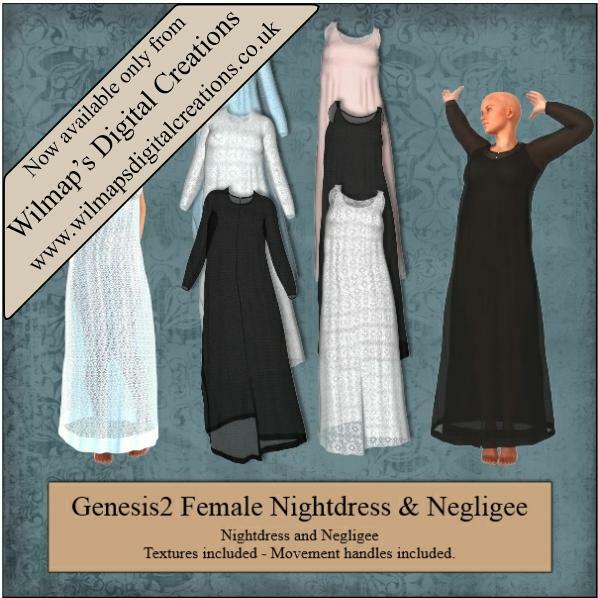 A Nightdress and Negligee for Genesis for use in Das Studio 4.6. You may use this freebie for personal and commercial use but you may not distribute it nor claim it as your own. Wiccan (5 years ago) Inappropriate? Many thanks for all your efforts! Another useful item. Thank you very much! renecyberdoc (6 years ago) Inappropriate? thank you for all your generosity. Bobeagle (6 years ago) Inappropriate? Mechins (6 years ago) Inappropriate? zenrel (6 years ago) Inappropriate? Thanks so much Wendy for all the work you put into these wonderful items - and thanks for this conversion! Spydraxis (6 years ago) Inappropriate? If I haven't said it up till now I will say here...Thanks so much for all of the freebies. allot of artists take these for granted but I wanted to tell you personally how much I appreciate your hard work and effort. I will be forever grateful for your contributions. That was because it was in 3D models and not Daz. I had to re upload it. Thank you for this conversion to G2F! gingercakes47 (6 years ago) Inappropriate? Thank you for the conversion to G2F. Love it!